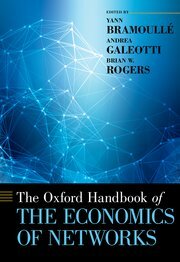 The Oxford Handbook of the Economics of Networks represents the frontier of research into how and why networks they form, how they influence behavior, how they help govern outcomes in an interactive world, and how they shape collective decision making, opinion formation, and diffusion dynamics. From a methodological perspective, the contributors to this volume devote attention to theory, field experiments, laboratory experiments, and econometrics. Theoretical work in network formation, games played on networks, repeated games, and the interaction between linking and behavior is synthesized.